Every year during the month of March, in honor of Frodo destroying the One Ring in Mount Doom, Tolkien fandom groups participate in Back to Middle-earth (B2MeM) events. Once again, the moderators at the Silmarillion Writers' Guild and Many Paths to Tread have teamed up to host a month-long challenge event to inspire our authors and writers during the month of March. Pack your bags, change the batteries in your camera, and don't forget the sunscreen--this month, we will take a month-long holiday to our favorite places in Middle-earth for Passport to Middle-earth, a daily creative challenge for our writers and artists. Every day, the tour will stop in a new location in Middle-earth and, with it will come a new challenge to tempt your muses. We invite you to create a response for one, some, or all of our daily challenges! Welcome to the Quenta Silmarillion, sit yourself down by the fire and hear the stories of old. The Silmarillion-Club is a group on deviantART centred around the early events from the world created by J. R. R. Tolkien: from the beginning of time up to the ending of the II Age of Sun, described in The Silmarillion, The Unfinished Tales, The Children of Húrin and The History of Middle-Earth. I think I need to be hard. I am more than 9 years an deviant here on dA. This is good for me to compare the past and now. And maybe have a clue how dA will be in the future. We were wrong. So wrong. What we got was a heartwarming coming-of-age story with endearing characters and interesting dynamics. It spoke of friendship and learning your self-worth and figuring out what drives you forward. The Adventure Continues - Promo GalleryThe Railway Series Books 1 and 2; The Three Railway Engines and Thomas the Tank Engine were adapted in The Adventure Begins special. 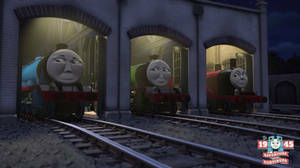 Here are all the promo images from the followup series "The Adventure Continues".